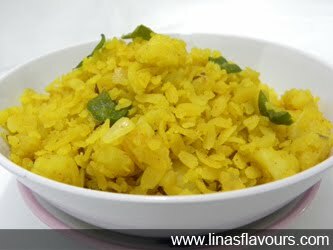 Take poha in a colander and wet it by pouring some water on it. Let it drain. Make small pieces from boiled potatoes. You can also use raw potatoes and then cook it. Take a pan and heat oil. Add cumin seeds, asafetida, curry leaves and let it crackle. Add onions and sauté it till it turns translucent. Add green chillies and cook it for about a minute. Add potato, salt, turmeric powder and mix it well. Add poha and mix it well. Cook it on a low flame for about 2-3 minutes. Add lemon juice and sprinkle about 2 teaspoon of water and mix it well. This will help to retain its moisture. Garnish it with coriander leaves and serve it immediately.